Trstenik (Korcula) Island, Adriatic Sea, Croatia Nearly 15,000m2 of elevated land position with seafront and 180 degree coastal views. 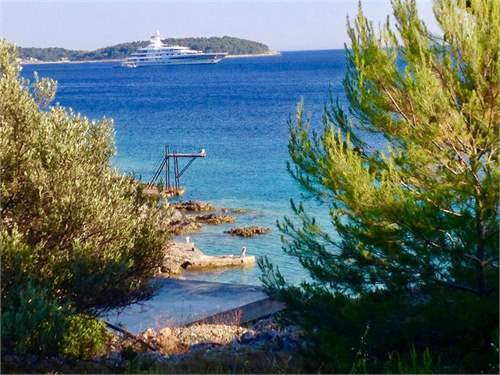 Located in the Dalmatian archipelago 7 nautical miles from Vela Luka Port between Split and Dubrovnik. Trstenik Island is located in the Dalmatian archipelago - 7 nautical miles from Vela Luka Port on the south-west side of Korcula Town between Split and Dubrovnik. The island parcel is 14,828m2 stretching from the sea inland and includes 125m2 of existing foundation (ruins) to build a two level house with total living area of 250m2 and cantilever. Sustainably built houses on the island have solar and rainwater cisterns. The elevated land position takes full advantage of 180 degree views making this property a truly rare find for its location, size of land and possibility of reconstruction on ruins over 100 years. For the discerning Buyer or Investor this is the ultimate location for an exclusive mediterranean lifestyle within pristine and tranquil surrounds.